GREENVILLE, N.C. – East Carolina University introduced its 22nd head football coach in program history, welcoming Mike Houston at a press conference Tuesday morning. Below are comments from ECU Director of Athletics Jon Gilbert and Coach Houston, along with selected responses to questions from the media. “First, I’d like to thank the Chancellor (Dr. Cecil Staton) and Dave (Hart) for assisting me through this process. Obviously, I stand before you less than 24 hours from formally accepting the job. I’m really excited to be here and this is an exciting day for East Carolina. A few other people I’d like to thank. J.J. McLamb was instrumental throughout this process. Obviously, I had a long history and understanding of East Carolina Athletics. I thought it was really important to have someone in the room when we talked to Coach (Mike) Houston to talk about the particulars. There were often times that I turned to J.J. and said J.J., help me answer that question on how we do things. So J.J., thank you for what you do for this department and this institution. I’m really grateful. “Two other people that I would like to thank that were instrumental. Paul Zigas, the university attorney. We were on the phone at all hours of the night and early morning. Paul, thank you for your commitment to this process and institution. And Stephanie Coleman. Stephanie was instrumental in pulling this all together. I reiterate what I said yesterday. It isn’t about me. It’s about this great institution, this athletic department and the many, many fine people that comprise this athletic department. That’s the reason that we’re all going to be successful, everybody in this room. So, thank you. “Coach Mike Houston has a track record of success. He’s been a very successful high school coach in the state of North Carolina. He was the head coach at Division II powerhouse Lenoir-Rhyne College in Hickory, N.C. I really think today, that looking down from above us, Coach Stas (Clarence Stasavich) has to be excited that a Lenoir-Rhyne guy is coming to lead the Pirates. It just warms my heart to think about that, knowing what I know about the history of Lenoir-Rhyne and East Carolina. Couldn’t be more excited about that. “He left Division II Lenoir-Rhyne and went onto The Citadel. Had a successful career there. Went onto James Madison. Won a National Championship there and had a great career track record. He hasn’t skipped a step. That’s one of the things that really impressed me about Coach Houston and his tenure. He’s been a high school coach. He’s been a Division II coach. He’s been a I-AA coach and now he’s moving onto the East Carolina Pirates. I think that is really one of the most impressive things about his track record. I know that he places a high value on culture, as do I. I know that he will bring a great culture to our football program. I thought that was one of the things that he really conveyed through the process, of how important culture was. His energy and personality are infectious. I saw that last night when he met with our football program. I thought it was important that our football team meet him first. Coach Houston and I are both here to serve them and help lead them and so I wanted to make sure he had the opportunity to do that. We have a lot of our team here today, which I’m thankful to you all for being here. “Good morning. I didn’t know that they moved Freeboot Friday to Tuesday. I expect it to be a little bit louder than this though. “I’ll start by thanking Chancellor Staton, AD Jon Gilbert and the East Carolina Board of Trustees for giving me this opportunity. As Jon mentioned, this is a place that I’m excited to be the head football coach at. This is the place I wanted to be the head football coach at. Growing up in the state of North Carolina, I know the tradition and history of East Carolina football. Being a high school football player in the late 1980’s and early 1990’s and then transitioning onto being a college football player in the state at Mars Hill University in the early to mid 90s, I remember what East Carolina was during that time period. I remember the Peach Bowl team that was as good as anyone in the country. A close friend of mine was an inside linebacker on that team. I remember the tradition that carried on through the coming years all the way into the 2000s. “I’ve been fortunate to have a stint as a high school football coach in the state of North Carolina. To have relationships with East Carolina at that time as they recruited the school that I was coaching at. I went onto Lenoir-Rhyne University, again in the state of North Carolina. Recruited the state from the mountains of Murphy all the way to the coast of Manteo. I knew the state well. But I always knew East Carolina football. I had stints in other states. We spent some time in South Carolina, in Charleston, which is very close to Amanda and me. We’ve been in Harrisburg, Virginia the last couple of years. Both stints were just fantastic stops. We have close friends and strong relationships and those institutions treated us incredibly. But at the end of the day, yesterday, when we landed in Greenville and we got off the plane, it truly felt like we were coming home. So, I want to start by saying that Amanda and I could not be more excited about the opportunity to bring Owen and Reid back to North Carolina and to lay down strong roots and foundation here in the Greenville community and to truly be back home. “You know the big thing that we want to do in starting this relationship is, I’m excited about our alumni. I’m excited about our fanbase. I want to establish a strong bond between those groups and our football program. We are Eastern North Carolina’s football program. In time, we will be North Carolina’s football program. But we’re excited to be here, and we’re excited for the opportunity of what we can build. When we talk about that, one thing that I want to hit on, the reason why I feel like this is a great fit for myself at this point in my career is the strong relationships that I have with the high school football coaches in the state. There’s so many of them that I either played with in college, I coached against or I know very well through recruiting. We have strong ties with the high school football coaches throughout the state and we are going to recruit the state of North Carolina very aggressively. We are not going to back down from anyone in the recruiting battle. We are also going to recruit the surrounding area, the Tidewater, Richmond and Norfolk areas in Virginia. We’re going to recruit the state of South Carolina. We’re going to recruit Atlanta. But our home base is going to be in-state football players. 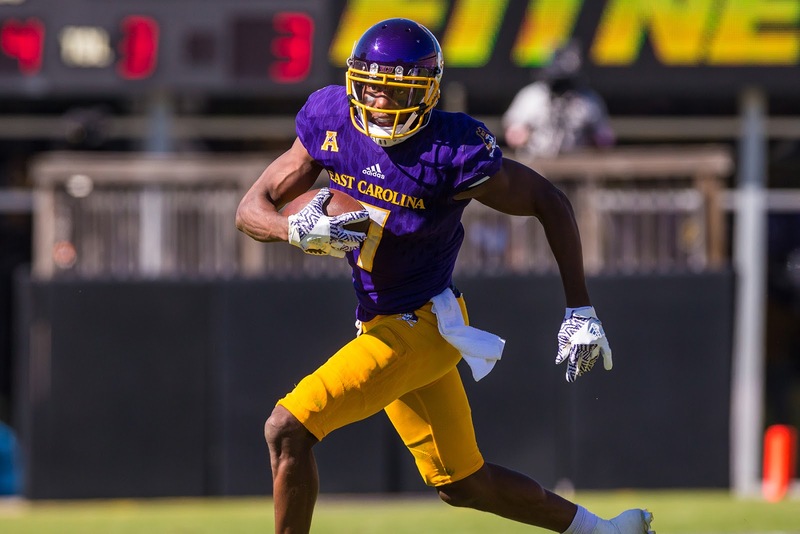 “The key to me, is establishing what East Carolina football is going to be. What is going to be our identity? I had the opportunity to meet with our football team last night and I laid out our plan and our expectations. It’s going to start with how we operate on a daily basis. I’m a firm believer that if you want a certain identity on gameday, then that better be your identity year-round. I can promise you that we are going to be a hard-nosed, fundamentally sound, disciplined football team. That’s what we’re going to be. We’re going to play with tremendous intensity. We’re going to play with passion. We’re going to play with fire. We’re going to compete and go toe-to-toe with anybody we match up against. But that’s going to be our mentality year-round. We’re going to have a family atmosphere inside the football building. I talked to the players last night about what that means. Every coach in the country talks about a family atmosphere. We’re going to live it. I’m going to be heavily involved in the lives of our student-athletes. We’re going to be involved in their personal life. Who they’re around, what they’re doing, where they are, how they conduct themselves. Your last name is ECU. It’s something that is very important to me. I talked to them about that last night. Because, if you’re a football player, if you’re a coach, if you’re a representative of an institution, then you’re not just a representative of that institution while you’re at work that day. You’re a representative of that institution 24/7, 365. So, the players are going to understand that when they go out and they’re around town, if they’re out across campus, if they’re back home, their actions represent East Carolina university. They’ve got to understand that when someone speaks of them, they’re going to speak of East Carolina football player whomever. “With that comes great responsibility and great accountability. That’s something that we’re going to build our program on. The way we train, the way we practice is going to be reflective of how we play. I’m not naïve enough to think that we’re going to be able to turn around tomorrow and be what my vision is for this program. It’s going to take a lot of hard work. We spoke about that last night. We spoke about the commitment it’s going to take in the weight room. They’re going to have a certain plan laid out for them over the Christmas break. When they come back in January, they will never have worked as hard as they’re going to work this spring, this winter in that weight room, on that field to prepare the team to represent East Carolina University the way it deserves to be represented. “First, this past week’s been a whirlwind. We were in the national playoffs, preparing for a second-round playoff game this past weekend up in New York against Colgate. I was contacted at the beginning of last week by UNC Charlotte. At that point in time, this was not a viable option. There was no vacancy at East Carolina University. As we worked through the week, I was contacted Thursday afternoon, right before I went on the practice field, by Dave Hart. He said he would like to talk to me about this opportunity. I was getting ready to go on the field, so I asked if I could call him back Thursday night. We had a great conversation Thursday night, which I immediately called my athletic director, Jeff Bourne, which Dave had already talked to Thursday morning, and told him I had spoken with East Carolina University. I also then called UNC Charlotte, athletic director Mike Hill, and informed him that I had talked to East Carolina University and I had interest in talking to them further, after the weekend. “My big thing was, I had a team and we had a ballgame on Saturday. I hate that our profession has gotten to the point, the college football landscape has gotten to the point with the early signing day, where as a coach, you had to deal with that while you’re still playing. But the reality is, if we weren’t still playing, I wouldn’t be dealing with it. The fact that we were one of the top programs in the country is the reason that I have these opportunities. So, trying to manage it as best we could was a priority. No matter what you try to say or not say, people at other places, it seems like they talk, and things get out. There are no secrets anymore. So, the whole world went through that whole deal with us last week. “Well, I think James Madison is a little bit different from my other stops. JMU is one of the top two or three programs in the country at the FCS level. That’s a program that’s going to compete year-in and year-out with a lot of the mid-major FBS institutions. So, the funding there, the facilities there, the commitment to football there, is as good as it gets at that level. That’s a different animal when you talk about the Citadel or Lenoir-Rhyne University. I think the culmination of all three experience is what I will bring here to East Carolina. The combination of having to take over a program at Lenoir-Rhyne University that had one winning season in the past 20 years, had not been to the playoffs in 50 years. To take them to three-straight conference championships and a national championship game appearance, that was an experience in building that program that was extremely important. “Well we’re going to be a very multiple, very balanced, spread offense. We’re going to run the football and we’re going to run the football with physicality. We’re going to throw the ball effectively try to spread the field sideline-to-sideline and we’re going to try to attack vertically in the passing game. We’re going to try to get downhill on people in the running game. I think the identity of your football team is built by your offensive line so that’s going to be something that is very important. The way they train this spring, the way they train during fall camp.